Boy, what a day! The Lord really blessed in so many ways! 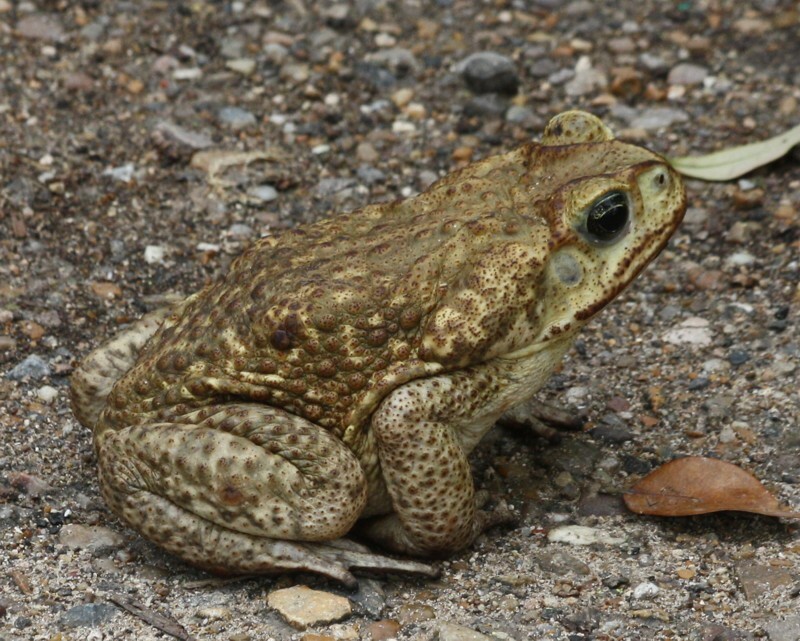 The basic aim was a rarity/target hunt, so began the trek at South Padre at dawn, where it was still rather gloomy and even spitting a little. The bay access was inaccessible, and even so the only visible birds were Laughing Gulls and a distant fly-by Brown Pelican, but the best bird was in the grassy stuff as I swung around to leave: a singing Sedge Wren! I'm amazed the recording came out, as he was pretty far back in there (the "outer-spacey" sound is due to the "noise reduction" feature: it takes out the hiss, but leaves that weird noise in the background...) According to the TOS Handbook, Sedge Wrens aren't supposed to get this far south in winter, but a few always show up, and behind the Convention Centre (next to which is said bay access) is one of the best places to get them! Next stop was the Convention Centre proper; Pat Heirs had warned me that they were doing some kind of construction, but that was primarily right around the main building, and you can still access the migrant trap area and the boardwalk. Having said that, there were no migrants to be had except for Ruby-throated Hummingbirds and Butterbutts! The waterbirds were the biggest attraction with the Big Three Terns all yelling and courting, and a nice collection of shorebirds out back, including a couple of Marbled Godwits, a couple of Short-billed Dowitchers, both flavors of yellowlegs, some Willets, and the biggest surprise: four American Golden Plovers that came wheeling in! (They lack the white in the wings and the tail of the more expected Black-bellied Plovers...) There was a nice mob of Black Skimmers lounging, and Clapper Rails were sounding off left and right! 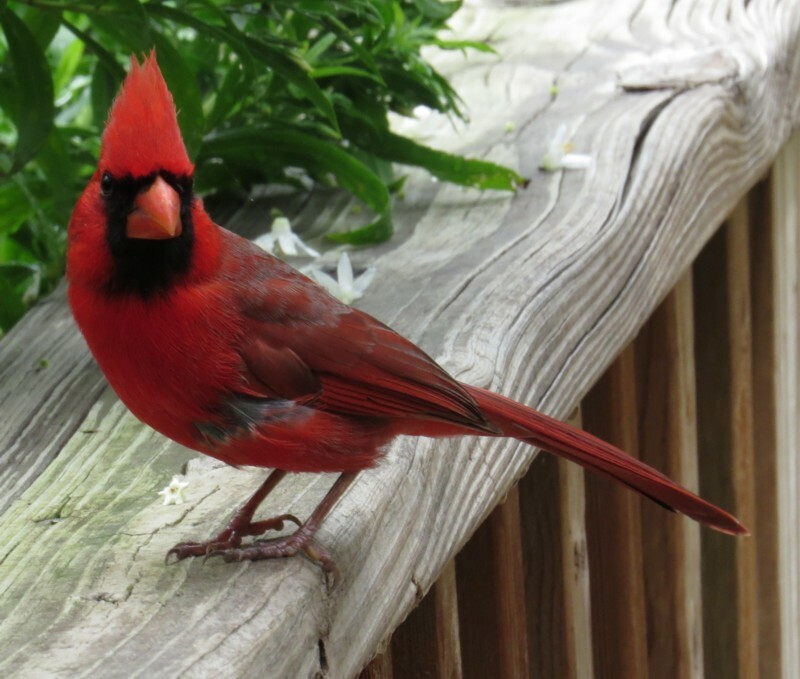 From the rear patio I spotted a Belted Kingfisher on the boardwalk, who had left by the time I got over there... Swallows were all over; most were Roughwings and Barns, but I thought I might have had a Cliff: had the pale rump, but couldn't get a bead on the "headlights". 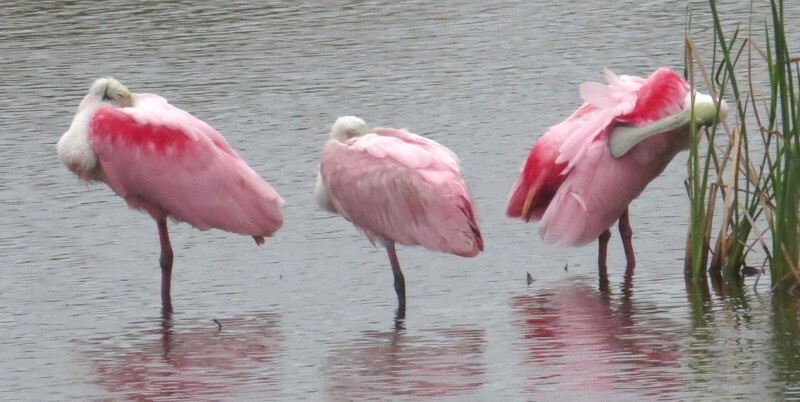 The boardwalk was a little more productive, with three knock-down gorgeous Roseate Spoonbills loafing in the eastern pond, along with some Black-necked Stilts and Blue-winged Teal. I turned around just in time to see a female/young Least Bittern explode out of the reeds and promptly disappear, apparently disturbing a Green Heron that started "scalp"ing (he was sitting quietly among the reeds further down the boardwalk...). 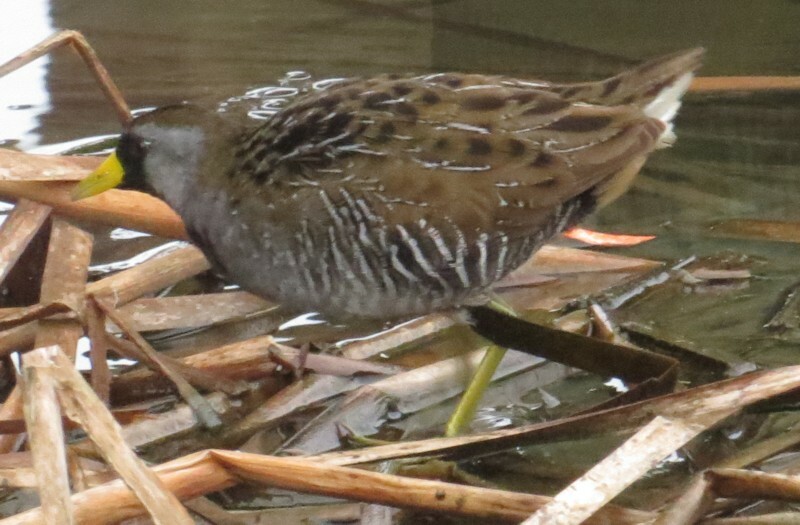 A Pied-billed Grebe was gagging down a fish half its size, and Common Gallinules showed off in the open. 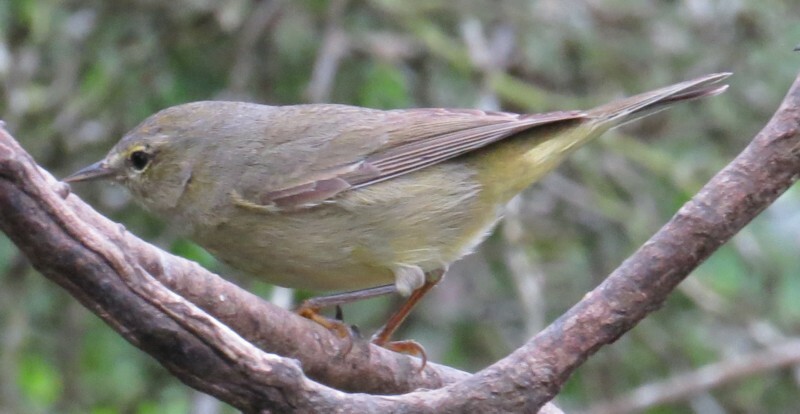 I ran into a couple with Big Guns, and the gentleman had seen a "wren" which I assumed was the Marsh Wren I heard and saw just after that, but when he showed me the picture, his "wren" turned out to be a Yellow-throated Warbler! Nice find out on the boardwalk! ☺ A lingering Tree Swallow swooped by, and my FOS Chimney Swift went batting by at the end of the "short" boardwalk, where a Sora was right out in the open! 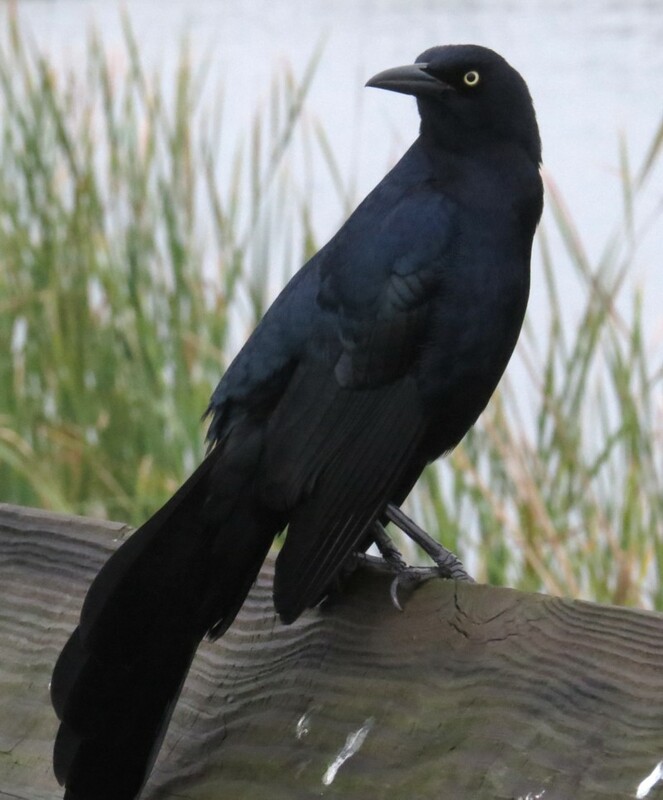 A Cooper's Hawk went barreling by as well, and that one grackle who always seems to be in your face was at his post right there on the railing, insisting upon being photographed! He always seems to be in the same spot, sitting inches away, insisting you take his picture! Pied-billed Grebe finishes gagging down a pretty big fish for his size! 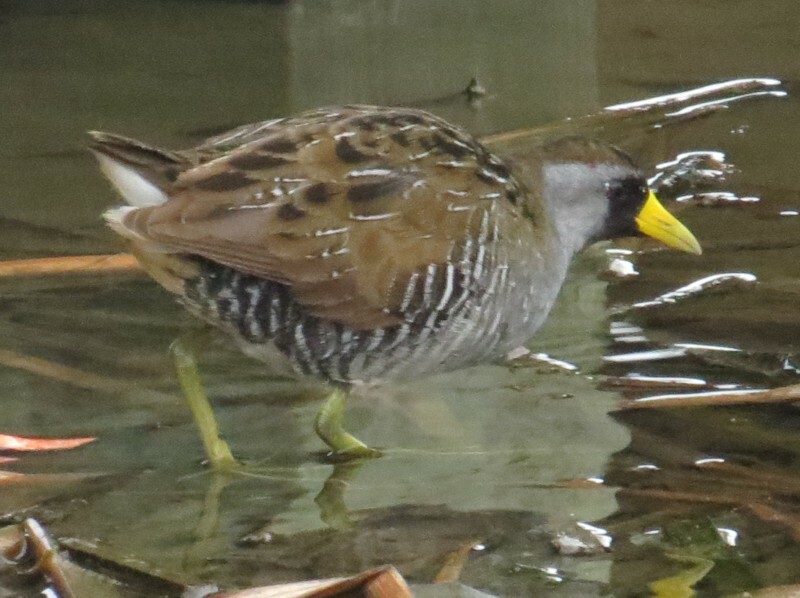 A Sora uncharacteristically out in the open! From there I backtracked to the other leg of the boardwalk that takes you out to the bay; out in the water were several Red-breasted Mergansers and a few White Pelicans, and a Tricolored Heron stood stoically against the vegetation. 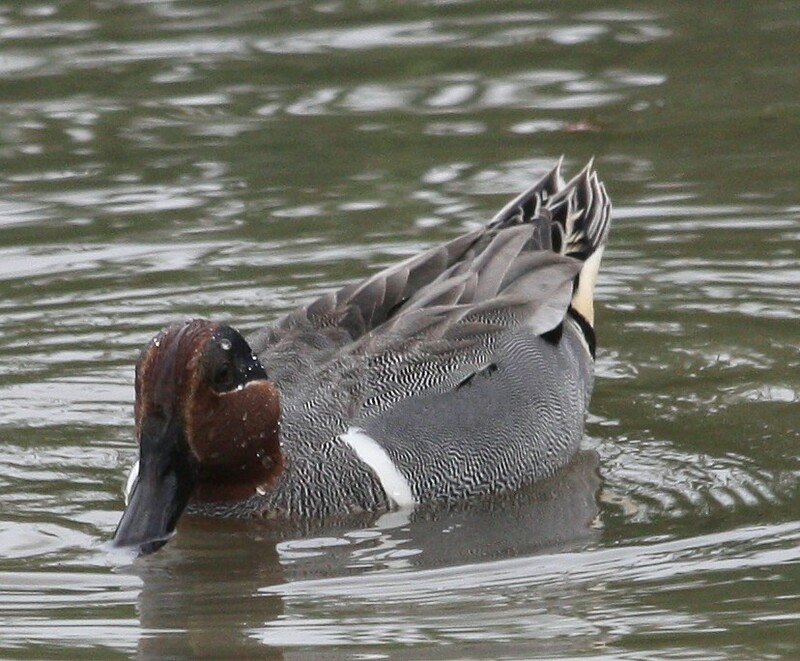 Lingering Redheads and Lesser Scaup flew past, but that was it for the ducks. Another scan of the larid flock added a first-year Herring Gull, but everything else was too far away to pick out anything different. 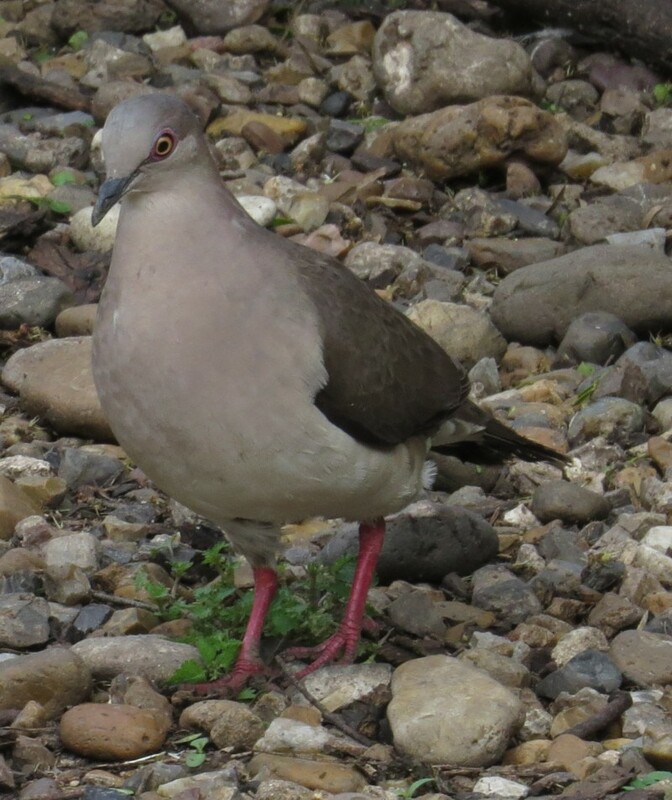 Headed back to the car after that, picking up the requisite Collared Dove for the day on the way out. 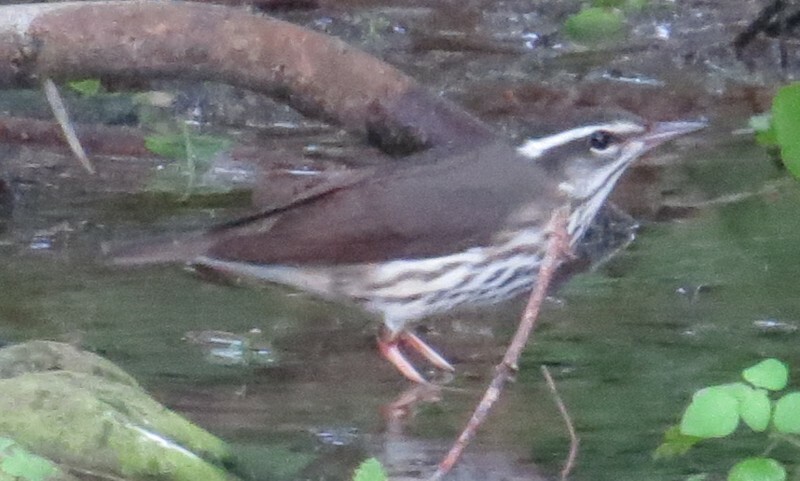 Louisiana Waterthrush - fuzzy, as it was dark back there, but the pertinent field marks show well: broad white supercilium, sparser breast streaking than Northern, bright pink legs, and clear white throat (although Northern sometimes shows an unstreaked throat). 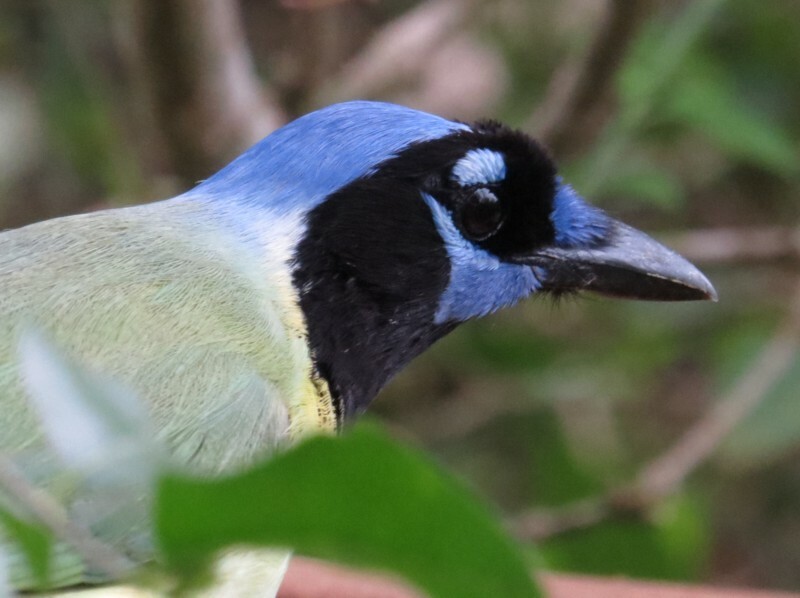 From there I headed up to Laguna Atascosa: there had been a report of a Red-bellied Woodpecker along the entrance road, and although the Blue Bunting hadn't been reported in a long while, I thought I'd give it a shot. Harris' Hawks and Harriers were plentiful along Buena Vista Road, as were Eastern Meadowlarks and both flavors of vulture (along with a token Caracara). 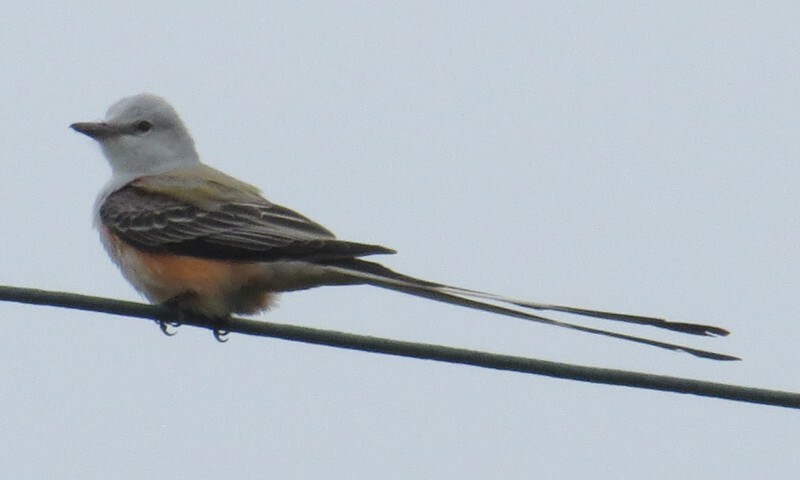 A Bewick's Wren sang unseen, a Couch's Kingbird cooperatively identified himself, and finally picked up a Shrike on a wire. 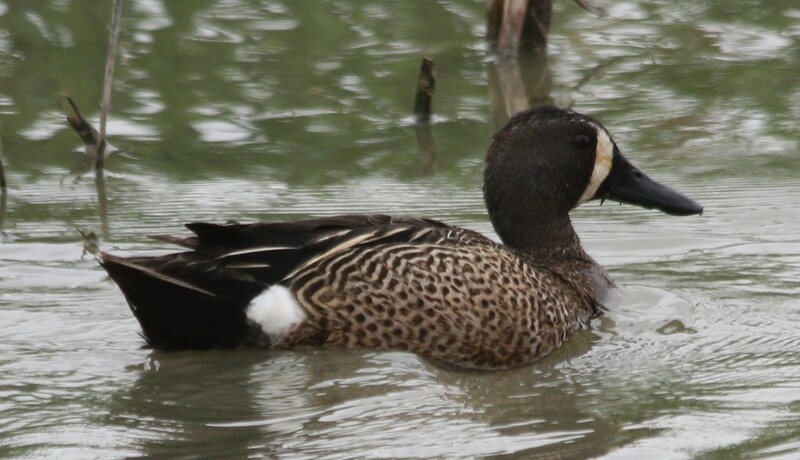 There were lots of flooded fields, and once past the intersection with General Brant, there was a nice collection of Blue-winged Teal with a single lady Shoveler. Once into the thornscrub habitat the usual suspects got added to the list post haste: Verdin, White-eyed Vireo, Olive Sparrow, Cactus and House Wren, Cardinal, Green Jays, Long-billed Thrashers, Kiskadees, and of course lots of Golden-fronted Woodpeckers (and I checked every one of 'em, too ☺)! The photo blind at the Visitor Center had quite a few White-tipped Doves doing their "turtle dove" coo, and the jays were trying valiantly go get a drink from the hummer/oriole feeders! 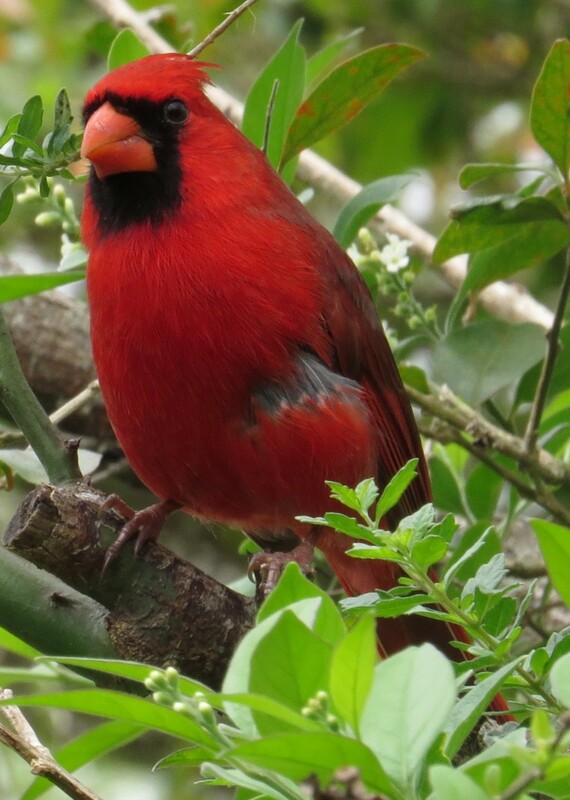 (I did hear an Altamira, but he never showed himself...) An Orange-crowned Warbler tried to find something left over in the PB feeder, and some distant Chachalacas made some subdued noises. 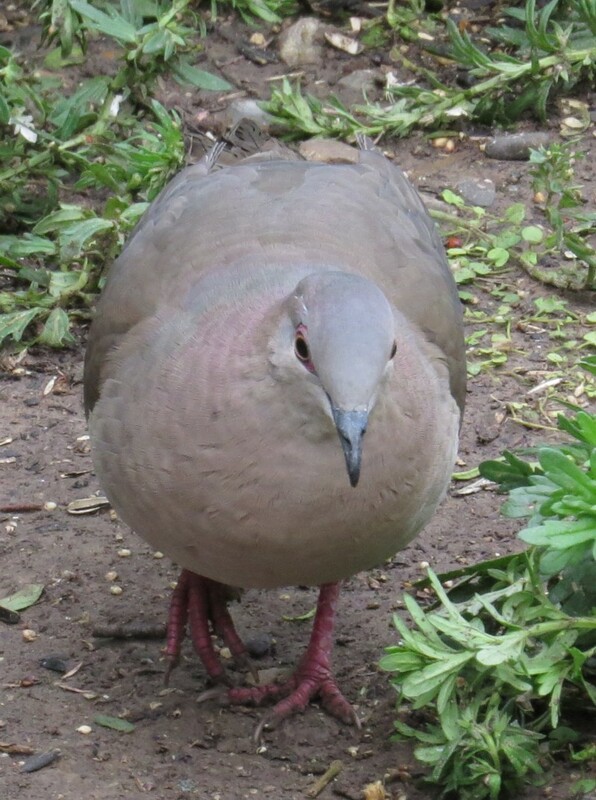 A Titmouse came in briefly, and a White-winged Dove sang unseen. Back on the sidewalk, I noticed a non-birding tourist shooting something in the tree with her PAS (her hubby was pointing it out), and after she was done I snuck up to find a nice Ladder-backed Woodpecker whanging away, paying no mind to the people! 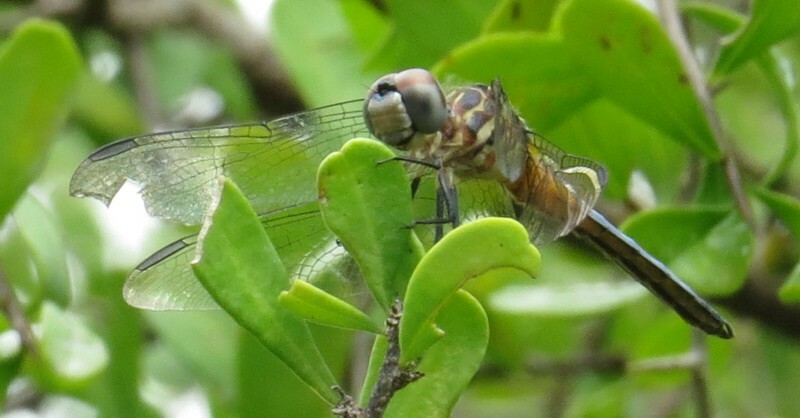 The Kiskadee Trail was pretty dead, so I checked out the gazebo area, shooting a couple of mystery odes: one looked like it might have been a female Blue Dasher, and the other had the pattern of a Familiar Bluet but it was almost mauve in color, so I have no clue; hopefully the Ode Guys can help me sort them out! 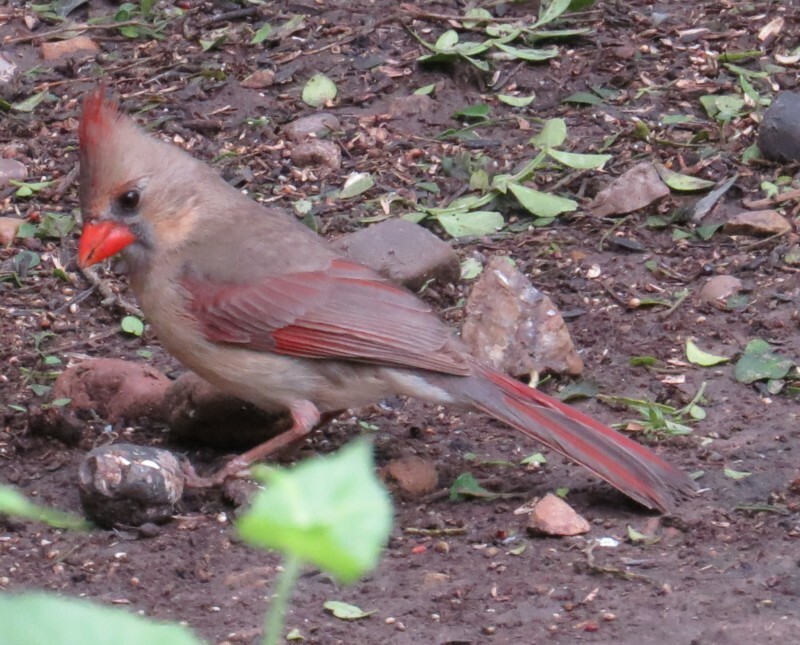 The water feature had more Green Jays attacking the hummer feeder, another White-tipped Dove strutted about, and a pair of Cardinals checked the joint out. 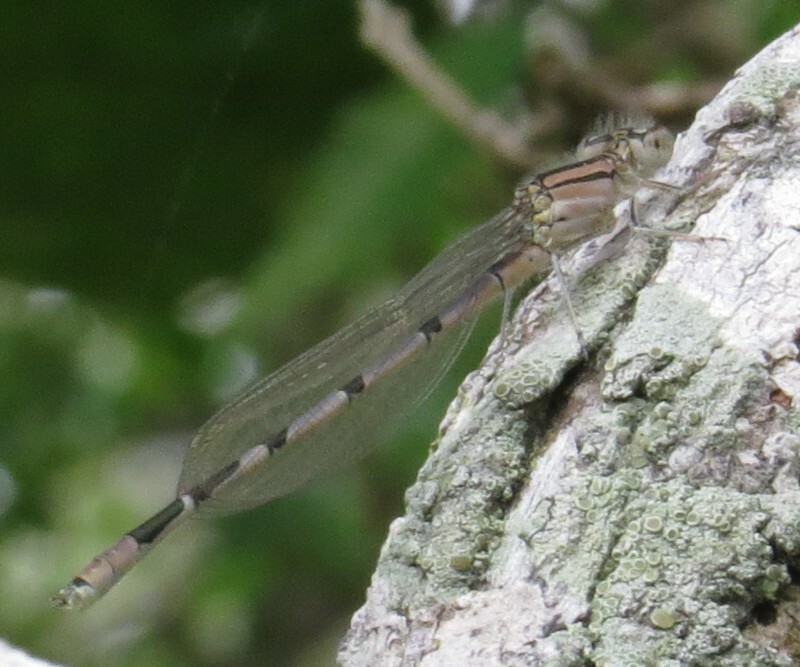 Mystery damsel - the pattern suggests Familiar Bluet, but the color's wrong--ideas?? 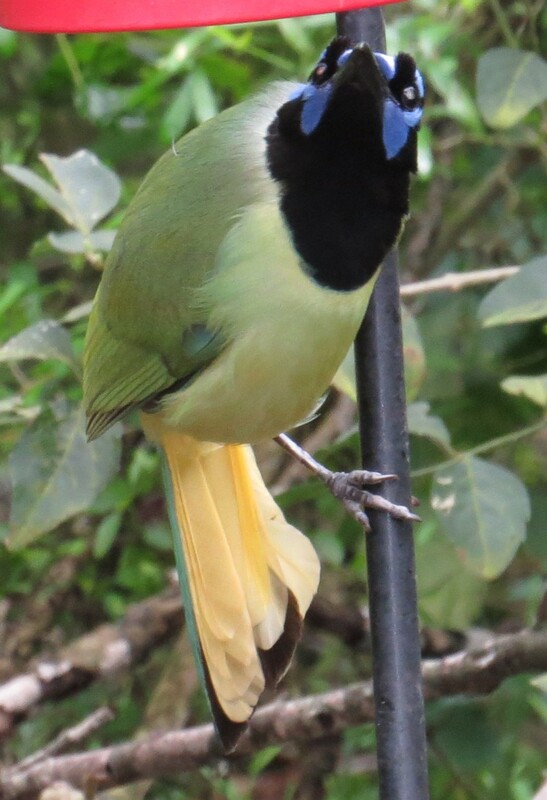 Green Jay portrait - check out those fuzzy eyebrows! 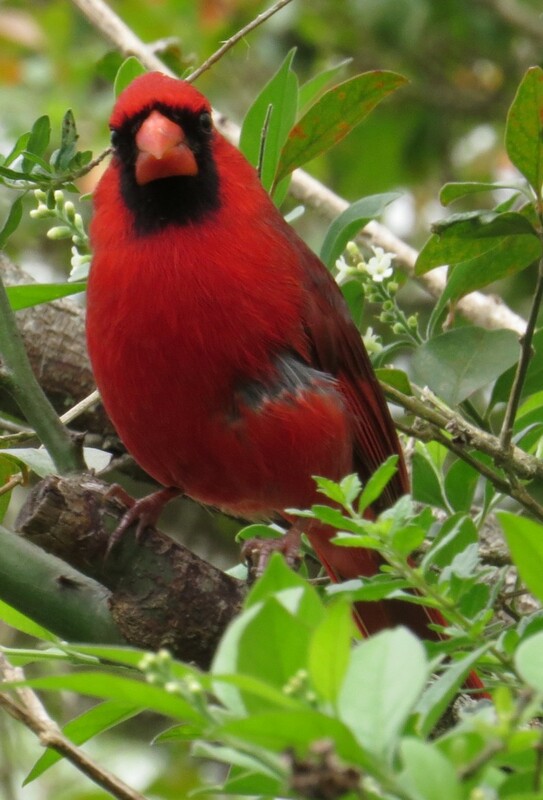 A male Cardinal plots his own approach to the feeding area! 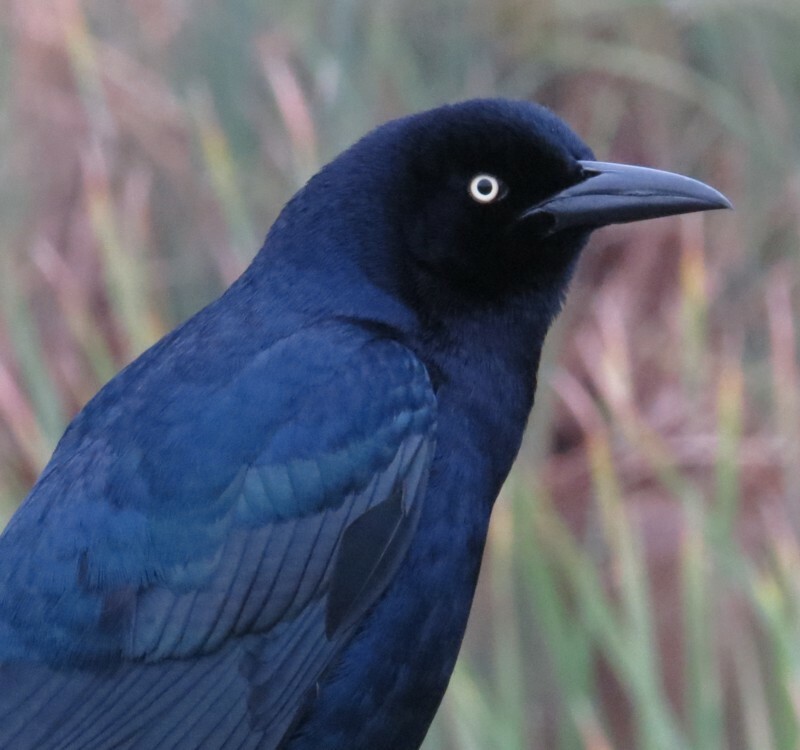 There had also been a report of Glossy Ibis in a field on FM 510 off FM 803, so I headed that direction, picking up a squadron of White Ibis going back down the entrance road, and a real surprise: a pair of Chihuahuan Ravens at the intersection! I stopped along General Brant to check out some white things in a field, and a nasal trumpeting to my left revealed a flooded thornscrub forest with Least Grebes and a couple of Coots! A stop at that little unnamed resaca (Google Maps calls it Cain Reservoir) yielded a handful of Gadwall and more Redheads, and a ballet of White Pelicans circled overhead as I pulled up to the bridge over the creek that feeds into Laguna Atascosa to the north. Another birding couple was there, and added Anhinga, Great Egret, an immature Little Blue Heron, and tons of Cave Swallows to the list here (the only songbirds I could kick up were Yellowthroats; I was hoping for a lingering Swamp Sparrow...). 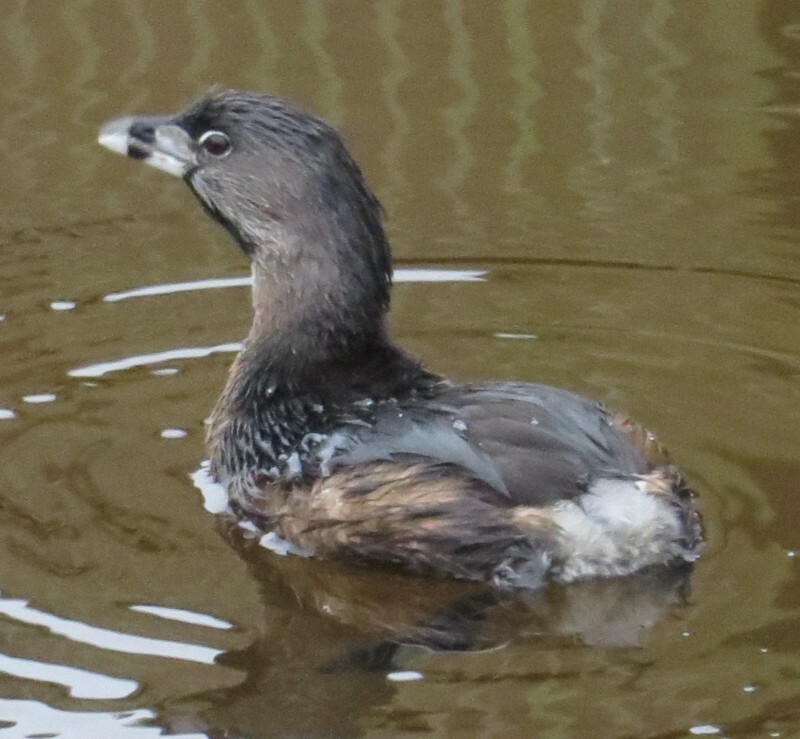 Trumpeting Least Grebe (along with what I'm assuming are chick peeps); listen carefully for the wavering call of a Pied-billed Grebe near the end! Both FM 510 and 803 were new to me, and I completely passed by 510 as it wasn't marked going south, so at SR 100 I had to turn around and head north again (which was a trip with all the traffic fleeing SPI)! The part of 803 that hugs that resaca is very scenic, but the rest of it looks rather seedy, and even after making the turn onto 510 I didn't see anything that looked bird-friendly (there were some plowed fields that I suppose could have had ibis in them at one time, but not today), so I just headed on in to San Benito, caught the freeway, and headed over to Estero Llano Grande. Two other long shots were reported here (Hutton's Vireo and Golden-crowned Warbler), but no one had made any additional reports, so I just took the short loop around Spoonbill Trail and back to the Tropical Zone to pad the list. 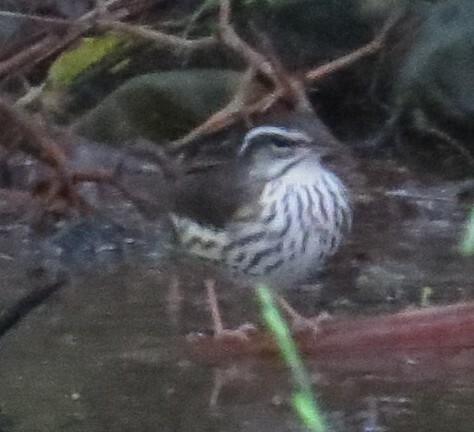 The couple I had run into at SPI mentioned that they had been here the day before (when the weather was so lousy), as they were hoping to pick up some wintering ducks, but they were in hiding and even Huck was disappointed with the short species list! But that was all different today: Ibis Pond was full of stuff, with new day birds including both Green-winged and Cinnamon Teal, Spotted Sandpiper, and a single Ruddy Duck. Blue-winged Teal were abundant, along with the Shovelers, and as I made my way to the picnic table on the opposite side of the pond, there was a suspicious-looking duck snoozing along with some Greenwings and Shovelers, and sure enough, when he decided to poke his head up, it was Ranger John's Green-winged/Blue-winged hybrid teal he had found the previous week! 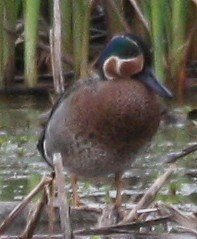 I showed him to another couple who wandered by; his bizarre head pattern makes him look kinda like a Baikal Teal! 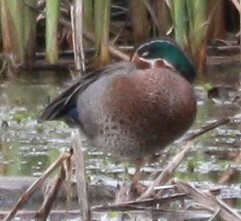 At Estero Llano Grande, both Blue-winged (left) and Green-winged (right) Teal were abundant! Put the two together and whaddaya get?! 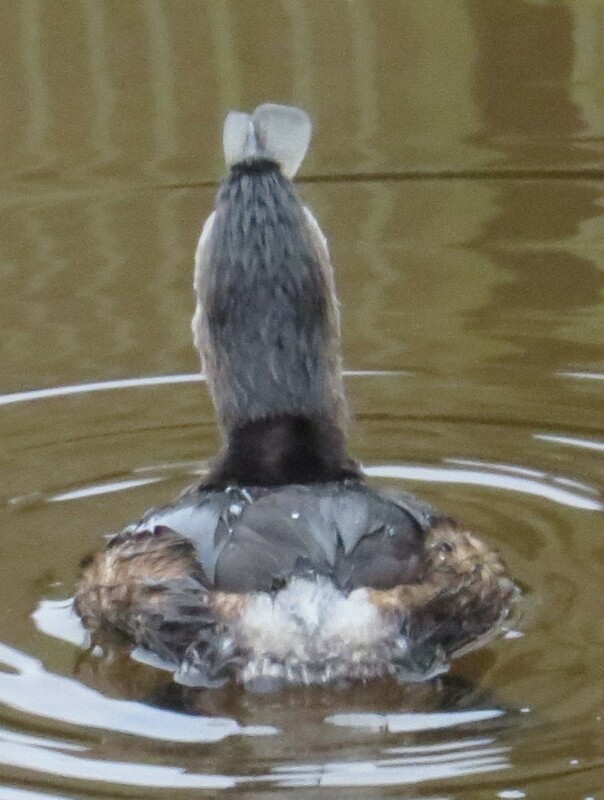 One bizarre-looking duck! 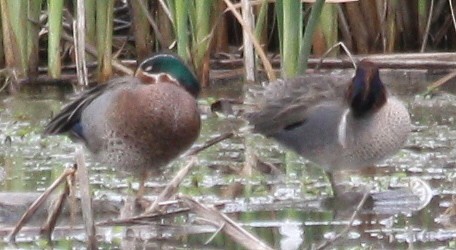 Here's the hybrid (left) with a snoozing Green-winged Teal. 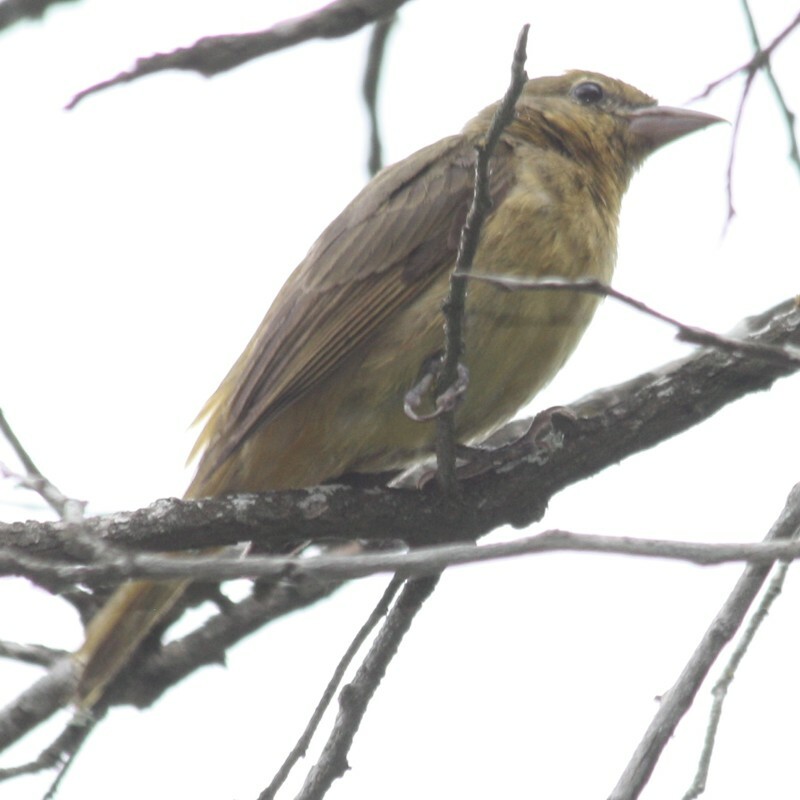 That made my day, but there were still some goodies to be had in the TZ: at one point I thought I heard the "ring" of a Clay-colored Thrush, but in trying to lure him out, the female Summer Tanager showed up! 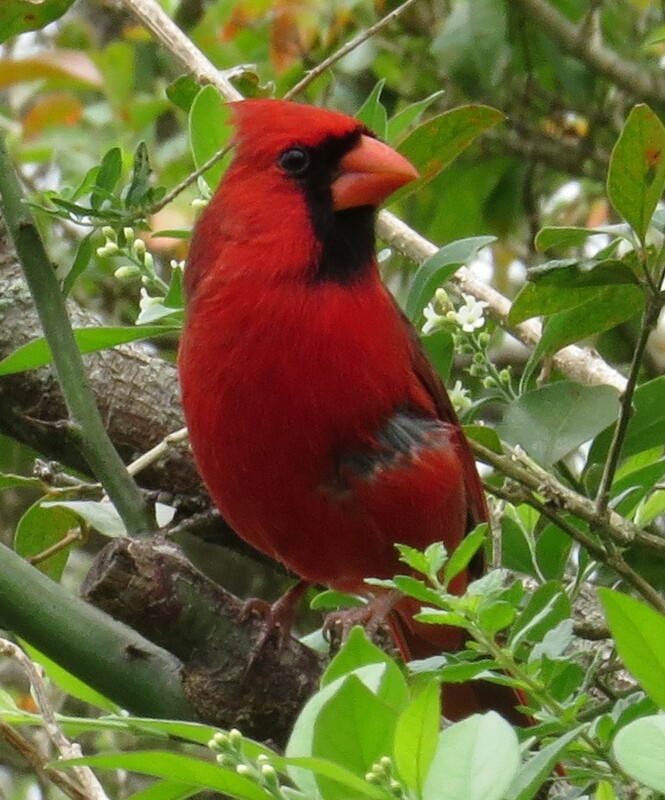 A Carolina Wren sang while all this was going on, and on the way to the parking lot a Blue-gray Gnatcatcher buzzed. 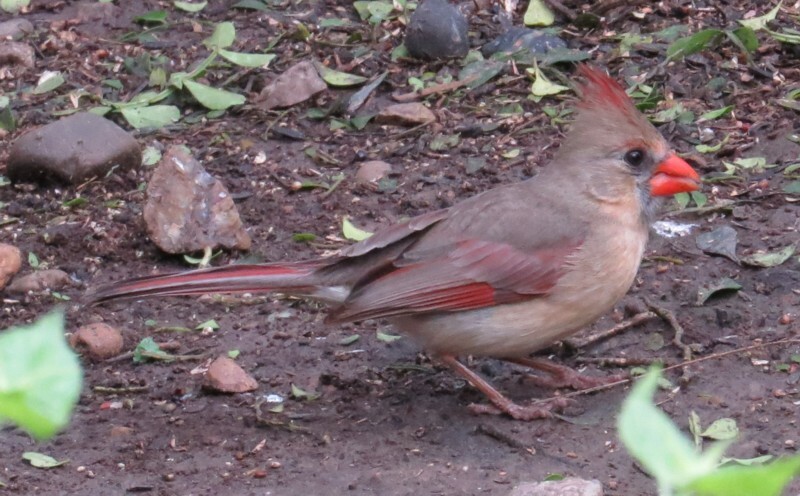 A big Cane Toad demanded attention, and a five-minute vigil at Rick and May's feeders bagged a nice Buff-bellied Hummingbird for the day, but no warbler or vireo - not even a look-alike Ruby-crowned Kinglet showed up! Somehow I had neglected to restock my wallet, and between the muffin at the first Stripes stop and a hot dog at the second one (plus the entrance fee at Laguna Atascosa), I realized I didn't have enough money to go to Santa Ana to try for the Say's Phoebe, so decided to hit Old Hidalgo Pumphouse, since I really only had time for one more stop anyway. That turned out to be a great move, because even though they had a lot of kids and families there, I headed straight for the picnic tables and was halted by that familiar yet rare-for-these-parts chirping of a House Finch! 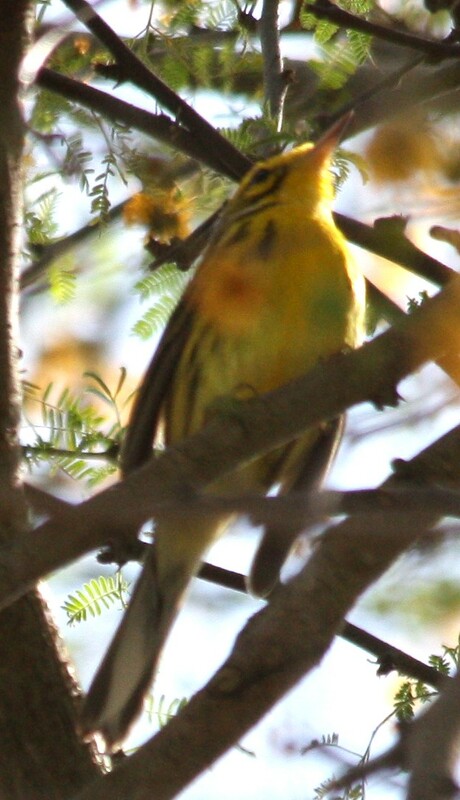 Finally found him in the depths of whatever tree he in, munching away on something, and I was about to get a documentation shot when a rising buzzy song (like a mouse with a toothache, our old ornithology teacher used to say) got my attention: the Prairie Warbler was still there, and singing! 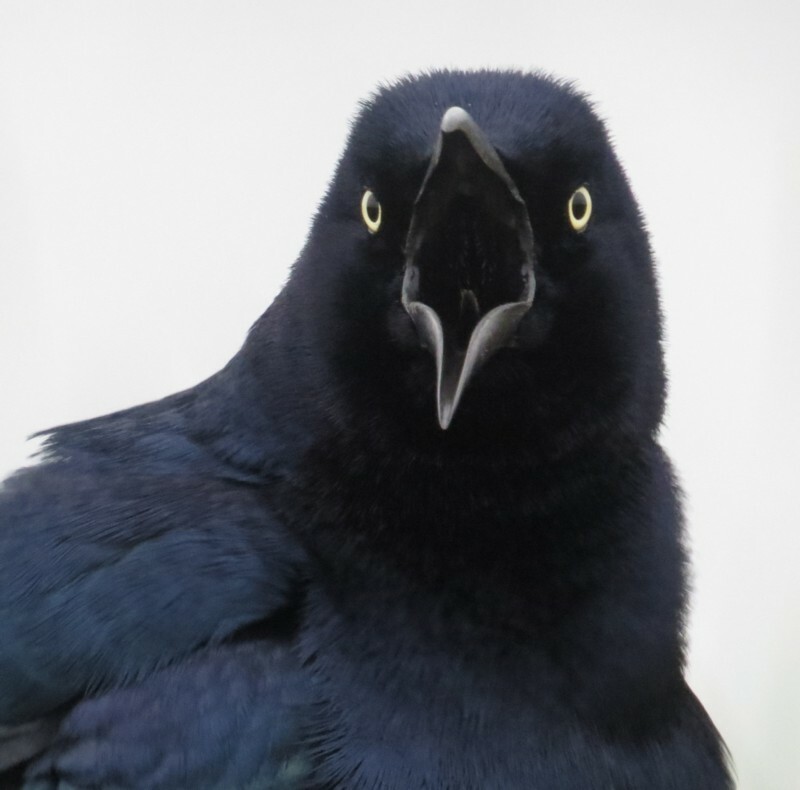 So after getting a few recordings (a lady who worked there got curious and tried to help me spot the thing), he finally darted into a tree with less foliage, and gave wonderful looks! His song was quite tentative, of course (not nearly as robust as the songs I was familiar with in Florida), but that was a very nice treat! 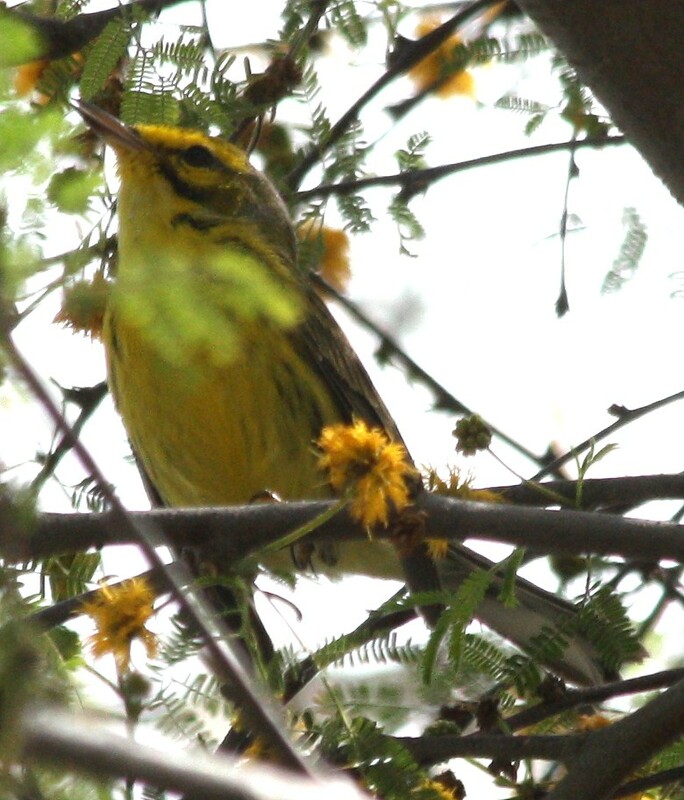 Lost Prairie Warbler that decided to overwinter at Old Hidalgo Pumphouse; even during spring migration these birds can be scarce in the Valley (and even then they tend to stick to the coast), so this was a real treat! 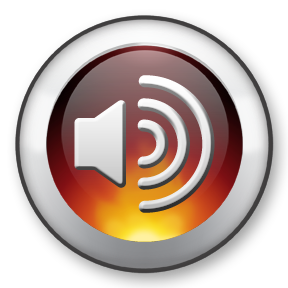 The buzzy song is the Prairie Warbler, but listen carefully for the chirping of the House Finch near the beginning of the recording! 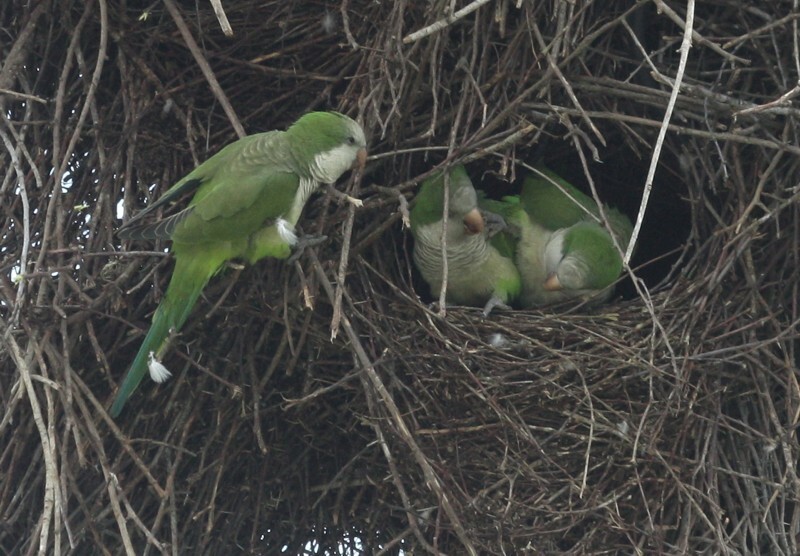 Everything was gravy after that, but I made a quick stop at the overlook long enough to bag the Black Phoebe, then decided to cruise Gardenia for the Monk Parakeets. There was no action at the original nest site, although I could hear them yelling in a tree way off the road (I always feel awkward gawking out the window as the neighbors wonder what the heck I'm doing...) I was on my way out when I noticed this huge nest on Gardenia, so I hung a left and had a ringside view of a whole family of parakeets! 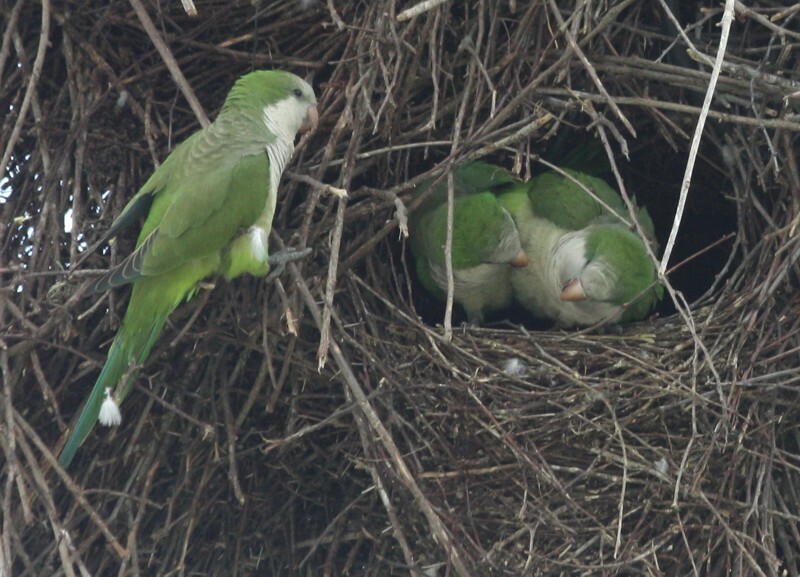 (A couple actually in the hole were wrestling with each other--so cute!!) 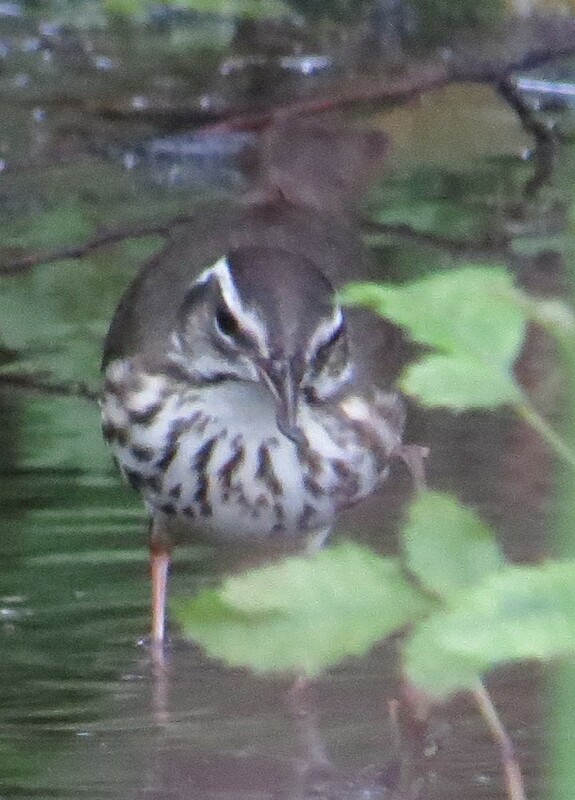 That was a great cap to a beautiful day, with a total of 107 species!